C-CAMP is envisioned to be a major platform technology, industry-interaction and incubator unit. Considering the vacuum that is present at the interface of academia and industry, such an organization is much needed in the country to be able to assure the success of scientific talent. At C-CAMP, we are generating state of the art platform technologies which are essential requirements for success and leadership in the field of life science. 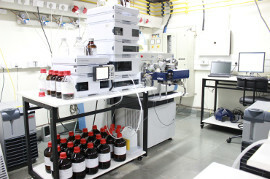 C-CAMP will allow investigators to use techniques as tools and not be limited by technological barriers while pursuing challenging scientific questions.